Last night was the final official meeting of our small group. Ten weeks flew by! 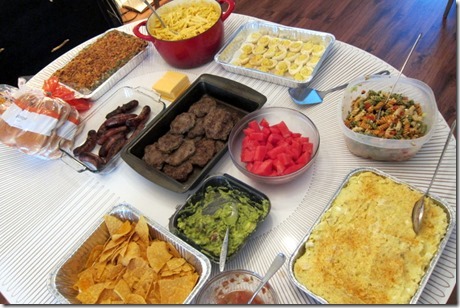 We met up at Lee and Katie’s house for a BBQ and dug into some of the most delicious food! Our group knows a thing or two about amazing food. One couple is from Louisiana and made red beans and rice from scratch and prepared a smoked turkey. Another couple runs two local restaurants and made everyone happy when they showed up with homemade chips, salsa and guacamole from Latinos y Mas. 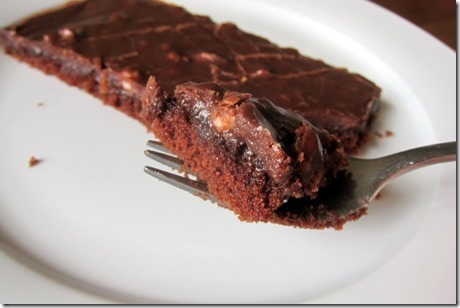 I brought the Pioneer Woman’s Best Chocolate Sheet Cake Ever and it was a hit! I’ve never made a sheet cake before and thought it looked more like brownies than cake, but the taste was fabulous. If you’re a chocolate lover like me, I highly recommend it! We served the sheet cake with cookies ‘n’ cream ice cream which was a winning combination. Ryan dubbed it “flat cake” and the name stuck throughout the night. 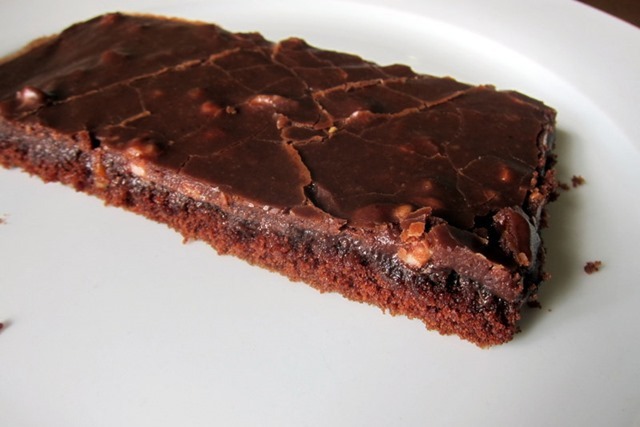 Though it doesn’t look like much, “flat cake” is pretty darn delicious! 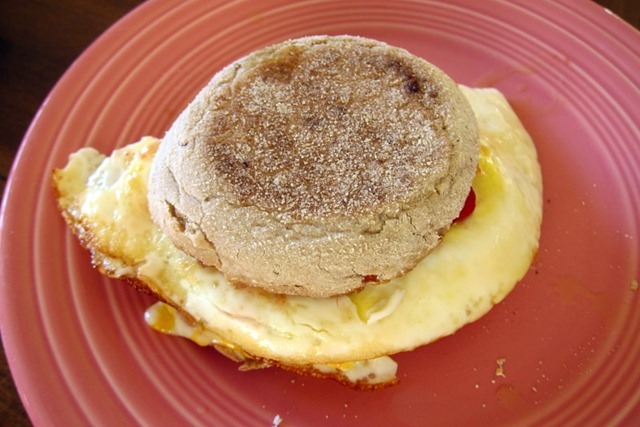 Since we were up later than usual last night and I will be working late tonight, I opted to sleep in a bit this morning and headed to the gym around 7:30 a.m.
Once I was done at the gym, I drove home and made a breakfast sandwich with eggs, cheese and strawberry jelly. Now it’s time to shower and head to work. I have a short break in my shift today, so I’ll be sure to pop in and say hi after lunch! Thanks to you I am addicted to those breakfast sandwiches! But I am not a big jelly fan so I swop the jelly out for fresh sliced strawberries…yum! P.S. That cake looks delicious, was it pretty easy to make? That reminds me of the sheet cake my mom used to make. We always froze the leftovers in little squares. 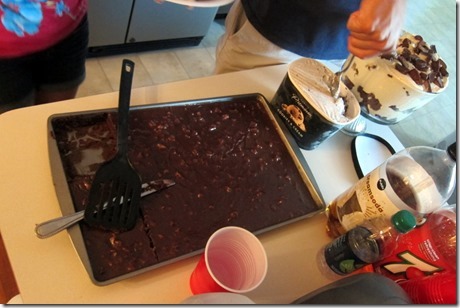 My sister loved the icing & I loved the cake, it would peel right off once frozen & we would share…so good! I LOVE this breakfast sammie combo now, too, thanks to you! It is delish! just finished the cardio+arm workout. loved it!! Running for only 5 minutes at a time really made the workout fly by! Love guacamole and chips that spread of food also looked good. I love your workouts! This is getting saved and I will be doing it soon! Makes the time fly on the treadmill, i’m sure! Imma steal that workout. Just FYI. How long does it typically take you? I like this workout! I much prefer sessions that intermix cardio with resistance. It also makes the time fly by!! Hey Julie! My friend and I tried your workout last night. We were definitely beat afterward. But we were wondering, when you run on the treadmill, what speed do you run? 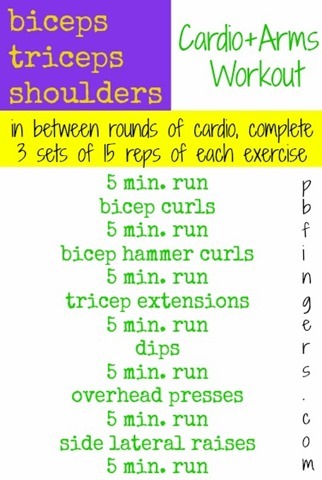 I did this workout between a 6.5 and 7.0! It’s really very complex in this active life to listen news on Television, thus I just use world wide web for that purpose, and take the newest information.